Jakarta - PT Toyota Motor Manufacturing Indonesia (TMMIN) for the 8th time has successfully earn the Primaniyarta Award 2017 in the category of Exporters Performance from the Ministry of Commerce of the Republic of Indonesia. 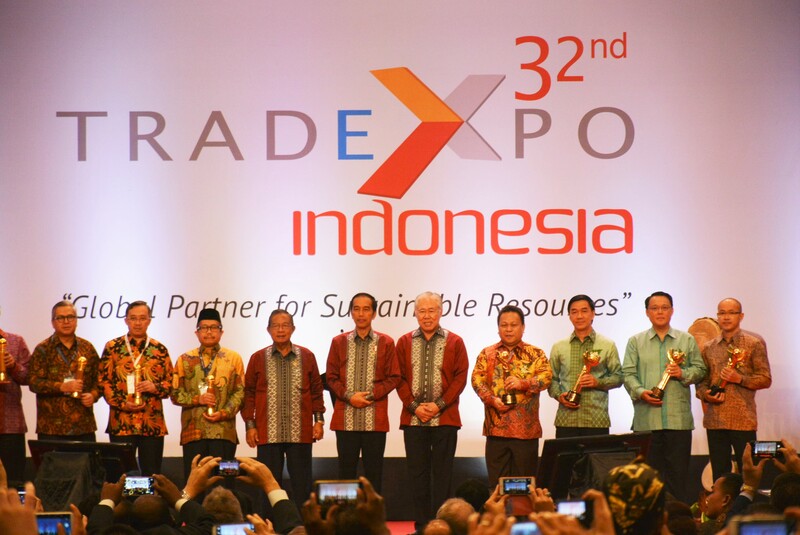 The Primaniyarta 2017 award was handed directly by the President of the Republic of Indonesia Joko Widodo who was accompanied by Minister of Trading, Enggartiasto Lukita to TMMIN's Vice President Director Edward Otto Kanter at the opening of Trade Expo 2017 located at ICE BSD, Tangerang, Wednesday (11/10). "The prestigious award we have received until the 8th times, we consider as a motivation to continue for consistently marked a positive export performance for the development of the automotive industry in Indonesia. This export performance is inseparable from the amount of government support that is currently very aggressive to build supporting infrastructure to facilitate our activities on contributing to the national industry, "said Edward Otto Kanter. The Government through the Directorate General of National Export Development (Ditjen PEN), Ministry of Trade began to conduct Primaniyarta awards in 1992 as one of the motivators and encouragement for exporters and other business company to continue to improve their achievement in export. Primaniyarta Award is the highest award given by the Government of Indonesia to exporters who are considered the most achievers in the field of exports. In addition, this award can be a role model for other exporters. The awarding of this award serves as one of the drivers and triggers for Indonesian exporters to improve their export achievements. Since 2014, Primaniyarta awards have been categorized into 4 categories: Exporter Performance Category, Exporter Category of Global Brand Development, Potential Exporter Category, and Exporter Category of New Market Pioneers. PT TMMIN is included in the category of exporters performance with the assessment of export activities with the value and volume of exports that always increasing from year to year. TMMIN also considered to have a positive export trend and has export value greater than its import value. Primaniyarta itself has been awarded to TMMIN since 2008, 2010 and 2011, respectively and received 5 times since 2013 until 2017. TMMIN is the only vehicle manufacturer to win Primaniyarta awards this year. TMMIN began its export activities 30 years ago. Initial shipment was carried out in 1987 by delivering the 3rd generation of Kijang (Kijang Super) to Brunei Darussalam. The best export momentum was obtained by TMMIN when it was believed to be one of the production base for the development of IMV (Innovative International Multi-purpose Vehicle) model of Kijang Innova in 2004, and directly exporting it in the same year. Followed by the beginning to the export Vios sedans in 2014. The achievement of TMMIN as an automotive manufacturing industry in Indonesia is not achieved briefly. Started as an importer in the 70's, TMMIN has gradually become a production and export base since 2004 and aspires to be a supply chain for Toyota Global. The addition of products and the presence of new machinery factory in Karawang is the realization of Toyota's commitment to continue to grow with the people of Indonesia as well as play an active role in the development of the national automotive industry. Currently, Toyota's total branded vehicle contribution to the national automotive exports in volume of 87%, consisting of 9 models of exports of Kijang Innova, Fortuner, Vios, Yaris, Avanza, Rush, Town / Lite Ace, Agya and Sienta. TMMIN also exports unraveled (CKD / Completely Knock Down) vehicles, petrol and ethanol engines of TR-K and R-NR types, vehicle components and production support in the form of jigs (welding tools), and dies (pressing tools) which also shows the depth of TMMIN industry. Throughout 2017 to September, TMMIN has recorded exports of approximately 150,400 of CBU units. This achievement increased 22% from TMMIN's incision last year, supported by Fortuner SUV volume of 52,500 units, Avanza MPV of 36,100 units, and 20.700 units of Vios sedans. While for CKD as many as 35,600 units, gasoline engine more than 99,850 units, ethanol machine as much more than 7,350 units, and vehicle components about 76.6 million pieces. In this year, to strengthen TMMIN's position as one of the leading manufacturers in Indonesia's automotive sector, Toyota targets an increase in exports of CBU vehicles by 10% compared to export figures in 2016. These products are exported to more than 80 countries in Asia, Africa, Latin America, Caribbean Island, Pacific and Middle East. "The investment and activity of Toyota's export performance in Indonesia for 30 years is a manifestation of our seriousness in working on and exploring the potential of a highly competitive market. Our hard work has resulted in confidence in TMMIN's role as one of the production base for vehicle, engine, and component of Toyota in Asia Pacific to meet the global demand, "added Edward. Since 2016, TMMIN has added 2 new export products, Sienta and Engine R-NR. The number of exports of R-NR engine units made by Toyota Indonesia throughout 2017 was significant by listing 74,600 units. Toyota Sienta, whose initial production has reached the local component level of 80%, in early August it has been exported with a standard of Euro6 drivetrain. Toyota Indonesia has been present for 45 years to grow and develop with the people of Indonesia. In accordance with the spirit of Toyota Berbagi (Together Building Indonesia), Toyota is strongly committed to providing products and technologies that suit the needs of customers, becoming part of the development of the national automotive industry, and play an active role in social activities.